The world's strongest and most complete calf raising system. The only thermoformed hutch available Manufactured using a unique thermoforming process and the highest quality polyethylene plastic, Calf-Tel hutches have strength and durability. UV blocking pigment - promotes longevity. Longest lasting hutch on the market. Whether you're raising just one calf or thousands of calves, indoors or out, the Calf-Tel® family of products offers calf raisers around the world the best and most cost effective systems for raising healthy, productive calves. 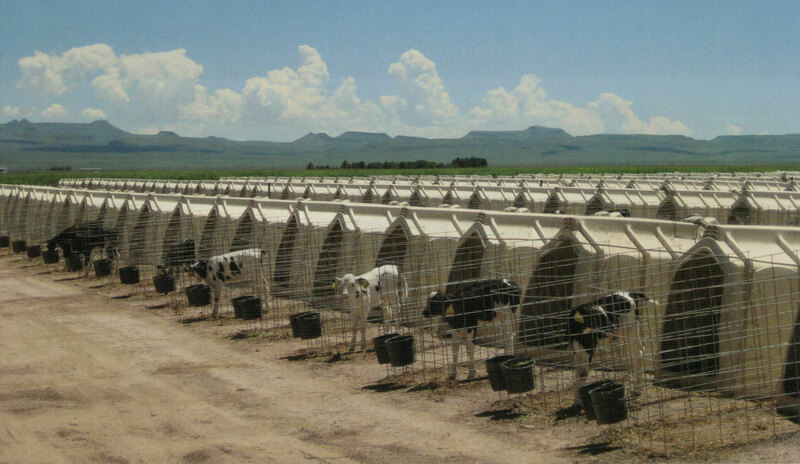 Calf-Tel is the only calf housing system on the market manufactured using a thermoforming process, which forms the product from an extruded polyethylene sheet. This process results in a molecular bonding within the plastic that is superior to other methods of plastics manufacturing - providing unmatched strength, durability and longevity. It's not at all uncommon to see Calf-Tel housing systems in use for 25 years or more - even in the most brutal weather conditions. Our unique manufacturing process, combined with the use of high molecular weight polyethylene material and steel, provides unparalleled strength and durability - and at a weight that's easy and efficient to handle. The galvanized steel frame at the base of every Calf-Tel hutch enables our hutch to maintain a structural integrity superior to that of un-reinforced plastic hutches. The tubular steel frame, encapsulated between the formed polyethylene sheets on our indoor calf pen door frames, provides additional rigidity not found in other plastic pen doors. Calf-Tel housing systems are completely opaque, preventing the sun and UV rays from penetrating the hutch and subjecting your calves to heat stress. Because of this opaque material, Calf-Tel protects your calves from the greenhouse effect that can otherwise leave calves vulnerable to heat stress in the summer and excess condensation and drastic shifts in temperature in the winter. The UV-blocking pigment further adds to the longevity, helping make Calf-Tel the longest lasting hutch on the market. Adequate ventilation is critical in limiting respiratory problems and heat stress calves may be subjected to in other housing with little or no ventilation. Calf-Tel housing systems are engineered for superior ventilation and come standard with the most innovative ventilation features in the industry. 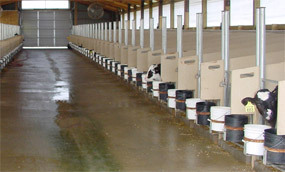 The polymer material used from which Calf-Tel housing systems is manufactured is non-porous and impervious to pathogens and manure acids. Unlike wood and other more porous materials, Calf-Tel housing systems are easy to clean and disinfect and do not absorb or promote bacterial growth - further improving calf health and performance. 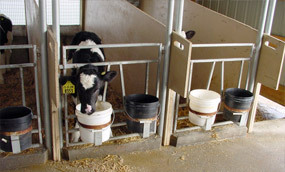 When combined with proper management practices, calf raisers have found that the use of Calf-Tel housing systems contributes towards lower mortality, morbidity, and overall treatment costs, and can aid in enhanced calf growth. For decades, calf raisers have seen their profitability enhanced by both the durability and efficiency provided by Calf-Tel housing systems. A longer lasting hutch translates to a lower lifetime cost. It is common to see the original model hutches, introduced in 1981, still in use today. No other hutch in the world has this proven track record! Our manufacturing process creates a nearly indestructible housing system without the extra weight, making the calf housing systems easy to move and clean. Combine this with trouble-free access to feed and water, and features that enable producers to bed the unit and access the calf easily, and you end up with labor savings that leave more money in your pocket.